2019 is shaping up to be a breakout year for bathroom design, with a ton of new trends finally overtaking a lot of long-standing contenders. Both white bathrooms and hardware-heavy tubs and showers are on the decline, and in their place 2019 bathroom trends are putting a strong focus on bold, tactile designs on the one hand, and comfort and usability on the other. Bathrooms this year are shaping up to become more relaxed and haven-like, but also a space to get creative (and a little daring) with your sense of style. One of the biggest 2019 bathroom trends is one that probably won’t surprise you: just about everyone is sick of minimalist white-on-white design, and this year it’s really starting to show. 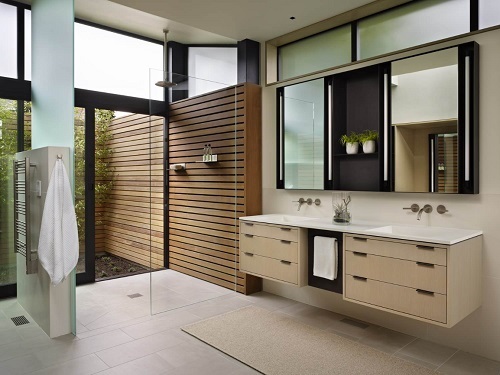 Bathrooms are skewing away from glossy white porcelain and back towards using warm, natural wood tones. Natural, unpainted, and reclaimed woods are especially popular, and really any wood (natural or veneer) that places a strong emphasis on the grain and texture of the wood should be at the top of your wishlist. Light, unfinished wood is winning out so far, but expect to see aged wood (gray tones) and some finishes that give that light wood a warm, honeyed glow. Some designers say this shift marks a return to a more natural bathroom feel, but the strong emphasis on wood grain makes me think it’s a little more tactile – people looking for something other than smooth, cold porcelain. Speaking of tile, generic subway tile in a traditional staggered brick installation is also on its way out. In its place, tile printed with bold, graphic patterns is making a major splash this year in both the kitchen and the bathroom. Expect to see them in full-height backsplashes, tiled shower accent walls or floors, and even modern takes on floor medallions designed to look like tiled area rugs. If you’ve been looking for a fun way to add patterning and detail to your bathroom, this trend might be the answer you’re looking for. Worried that too much tile will look busy? Start small, with graphic tile backing to recessed shelves, or a narrow ceiling-height strip to help showcase a freestanding tub. Sick of the sterile, monochromatic white bathrooms that have been flooding the interior design world for years now? Well, the good news is, you’re not the only one. In fact, 2019 is seeing a big pushback against the classic light-and-airy white bathroom, specifically in the form of dark, dramatic black bathrooms. And I’m not just talking cottage style vanities painted black (though including black accents is also on the rise). I’m talking full-on glam: glossy black tile, polished black granite, and even black paint. If the look feels a little too bold for a big master bath, consider tying it out on a smaller scale – like a guest bath or powder room. It’s a great opportunity to make a big statement in a small space. This year, many homeowners are looking to add square footage to their master bathrooms to make room for a freestanding bathtub. Specifically, sacrificing a closet in an adjacent room or hall is fast becoming a go-to way to create a tub niche as homeowners embrace the idea of having a “destination bathtub” to provide a getaway within their master suite. Now, to be fair, after years of volatility in what’s considered a “must have” feature for a master bathroom, I can understand a reluctance to embrace yet another big trend, but honestly I think the freestanding bathtub might be here to stay. The shower vs bathtub debate that’s raged for years now largely revolves around trying to create a luxurious bathing experience that can be enjoyed by someone with a busy schedule. Freestanding bathtubs not only look great, but they fill up quickly and without requiring extensive plumbing upgrades, which makes them both more affordable and easier to actually use on a regular basis than either a whirlpool tub or an ornate custom shower. 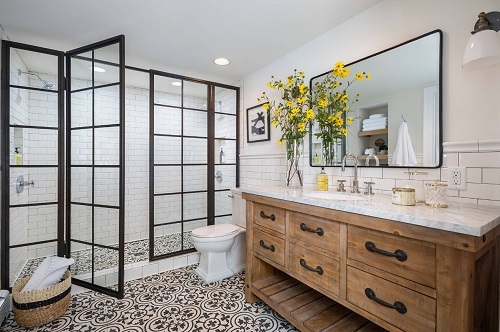 Many of the biggest 2019 bathroom trends revolve around comfort and ease of use, whether it’s creating cozy spaces that invite you to relax or simply making the spaces you use most often more intuitive. In that vein, one of the very most common new trends I’m seeing this year is actually one of the smallest changes: moving the controls for your shower out from under the shower head and to where you can reach them easily from outside the shower without getting wet. While this upgrade might seem insignificant (or not worth the expense), if you’re planning on overhauling your shower anyway, it’s definitely worth considering. It’s one of those little things that can make a big difference in your morning routine – especially if you’re sick of getting blasted with cold water first thing in the morning! Keeping in line with the idea of comfort, another big 2019 bathroom trend is adding a fire feature to your bathroom, either near some sort of seating (like a makeup table) or more often next to the aforementioned freestanding tub (in that destination bathtub tub niche!). While adding a full blown traditional fireplace is a project way beyond the scope of most home renovations, these days its incredibly easy to add a ventless fireplace to just about any room in your home. They can be built-in or freestanding and are fueled by ultra clean-burning liquid ethanol, which makes this project one that has a very big impact, but requires almost no actual setup, particularly for freestanding or tabletop fireplaces. One last big 2019 bathroom trend that I want to talk about is one that I actually don’t think will stick around: glass-free showers. Personally, I think this trend is taking the idea of “barrier free” to an extreme that admittedly looks great, but that I suspect people will tire of quickly in practice. 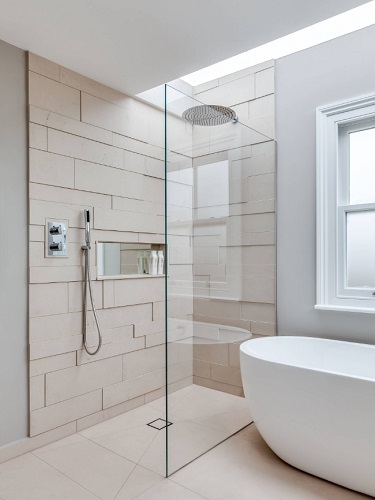 Showers that don’t have walls, doors, or any enclosure at all can be absolutely stunning and definitely make your space feel more open, but can also leave you feeling a little exposed while you’re actually showering, not to mention letting out all the heat and steam, which can make for a chilly experience. Instead, I’d suggest pulling a trend from a different part of the home: glass and black metal barrier walls. These have a sleek, industrial look that’s really popular right now and still give you an open-feeling bathroom, but are much more comfortable to use (and compatible with steam showers, if you want that high-tech touch!). Taken all together, the biggest 2019 bathroom trends are an invitation to play with your design, and more importantly to transform your bathroom into a space that’s warm, inviting, and easy to use. While not all trends are for everyone, hopefully this has given you an idea of what to expect in the year to come…and an idea for a project for your own bathroom! This entry was posted in Bathroom, Bathroom Vanities, Bathtubs, Decorating Ideas and Tips, Latest Trends, Showers and tagged 2019 bathroom trends, bathroom design trends, bathroom fireplace, Bathroom Ideas, Bathroom Tile, freestanding bathtubs, Master Bathroom.